Click "Expand the Universe" to see how atoms formed in the early Universe! After many thousands of years, expansion has cooled the Universe significantly. As a result, nuclei and electrons were able to come together to form atoms. 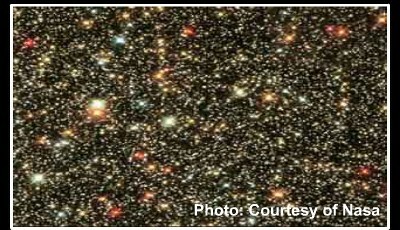 The first stars and galaxies were the result of gravitational attraction. By 3 x 108 years after the Big Bang, gravitational attraction between denser regions of visible matter and halos of dark matter cause atoms to come together to form the first stars and galaxies.